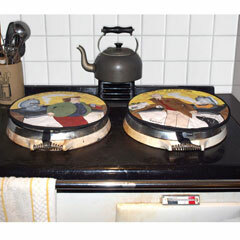 Give your AGA or Rayburn Cooker the makeover it deserves with these colorful Hob Covers suitable for the round Hob Covers on the AGA Cooker and the rectangular Hob Covers on the Rayburn Cooker. and the One Hot Mama Oblong Hob Cover for Rayburn Cookers. The AGA Hob covers a wide area of this cast iron cooker and each are round in shape. While actually part of AGA The Rayburn Hob covers a smaller area and is rectangular in shape. These colorful Hob covers are available NOW for worldwide delivery for both AGA & Rayburn cast iron cookers..
History of AGA & Rayburn. The AGA cooker is a heat storage stove and cooker, which works on the principle that a heavy frame made from cast iron components can absorb heat from a relatively low-intensity but continuously-burning source, and the accumulated heat can then be used when needed for cooking. Originally heated by slow-burning coal, the Aga cooker was invented in 1922 by the Nobel Prize-winning Swedish physicist Gustaf Dalén (1869–1937), who was employed first as the chief engineer of the Swedish AGA company (Swedish: Aktiebolaget Svenska Gasaccumolator, English: Joint stock company Swedish Gas Accumulator). The cookers were first imported to Britain in 1929, and were first manufactured there under licence in the early 1930s. The cast iron components were first cast at the Coalbrookdale foundry in the 1940s, where they are still made today by the Aga Rangemaster Group. The Rayburn is a type of stove similar in nature to the AGA and are manufactured in Telford at the same factory as the AGA. The Rayburn was launched in 1946 with two hotplates, and one or two ovens and the ability to heat water. They improved upon existing designs by having easily adjustable oven temperatures (competitors were dependent upon the heat produced by the fire at their heart). The original Rayburn came in a cream vitreous enamel finish. They were originally made in a factory in Falkirk which, at the peak of production, produced 1500 units per week, many of which are still in use today. In 1968, the first oil-fired Rayburn was produced. It was basically the same as the solid fuel model with the firebox replaced by an oil burner which was designed to burn continuously. 1971 saw the introduction of the first Rayburns capable of providing central heating. The early models could supply only a few radiators. The move to the AGA factory in Ketley, Telford, occurred in 1972. Modern Rayburns are classified into two categories - Cookmasters, which cannot run radiators, and Heatmasters, which can. Unlike the Aga, Rayburns are still available in solid fuel or wood fuelled versions. Irish Shopper supply a wide range of Hob covers for the AGA & Rayburn range of cast iron cookers available now for worldwide delivery. Their round hob covers suit most other makes of cast iron cookers featuring a round hob.